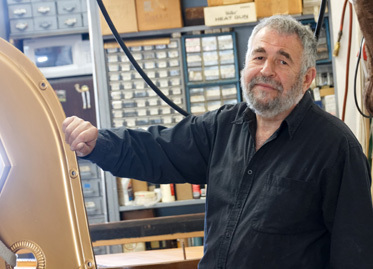 Yury Lifshetz, owner of Yury's Piano, has two conservatory degrees and has dedicated his work to piano tuning and restoration. Q. Tell me, Yury, how did you choose your career? A. My mother and my aunt were both pianists. They often invited student singers to our house for rehearsals. Their shrieking voices often woke me up when I was just a toddler. I believe that this early impression determined my life choice. A. I graduated from Music College and Conservatory. I was incredibly lucky to study with Prof. Isaac Zetel – himself a former student of the famous Heinrich Neighaus. From the age of sixteen I was working as an accompanist. Q. 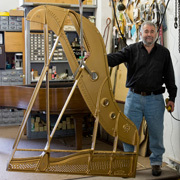 How did it happen that you became a tuner and a piano rebuilder? 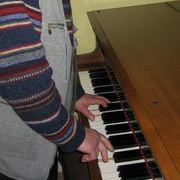 A. I was taking a course of piano repair and tuning while studying in the Music College. I successfully passed all the tests just to forget all I have learned. Several years after, I happened to work with the Philharmonic. Pianos there were very worn, and had to be repaired before each performance. Soon I had completely transformed myself into a piano rebuilder to earn a living. A. Moscow Conservatory. 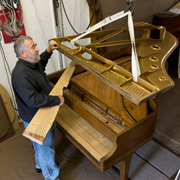 Working as a piano tuner there I gained invaluable experience in “troubleshooting”. I learned how to quickly repair a sticking key and how to change a broken string in the three minutes that were left before a performance. In Russia, piano tuners could not replace worn or broken parts because spare parts were not available; we had to restore old ones. Q. It must be far easier for you here where there is no problem with part supply? A. Of course, here I have the option to repair a part or to replace it. 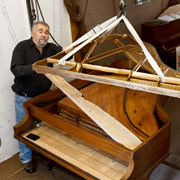 Replacing is easier, but often a piano with the original part sounds better. 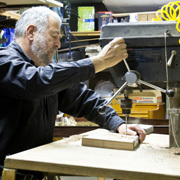 When properly repaired, the original parts can give new life to an old instrument. Q. You have spent half of your career in Russia. Do you prefer European instruments to American ones? A. 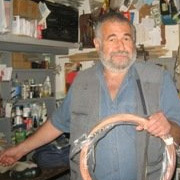 In Russia I dealt primarily with German instruments. Even now, I can’t really tell which pianos are better, German or American. Both instruments, made at the beginning of 20-th century, have an excellent design and sound. By the way, pianos made at the end of the 19-th century are even better. That is what I like doing the best; reviving those old hopelessly destroyed instruments. Q. I know you have sponsored numerous performances at your shop. Can you tell us a little bit more about that? A. The idea of the concert series came to me when one of my friends, a piano teacher, asked to use my shop for a student recital. After that, a few more pianists came to me and asked for a performance opportunity. We talked with Faina Bryansky and came up with the name for the concert series: “Tradition Reborn”. First concert of the series was a piano duet with two prominent Boston musicians Yakov Yakoulov and Igor Tkachenko. The concert was very successful; people still remember this outstanding performance and ask me when this duet will perform again. Since that concert we have had a lot of first-rate music: Rachmaninov, Liszt, Shostakovich, etc. The concerts are free but there is a catch at the end of each concert — my solo with a hat asking for donations. All money goes to the musicians, but I also have my reward - excellent music and a good excuse to clean up my shop.